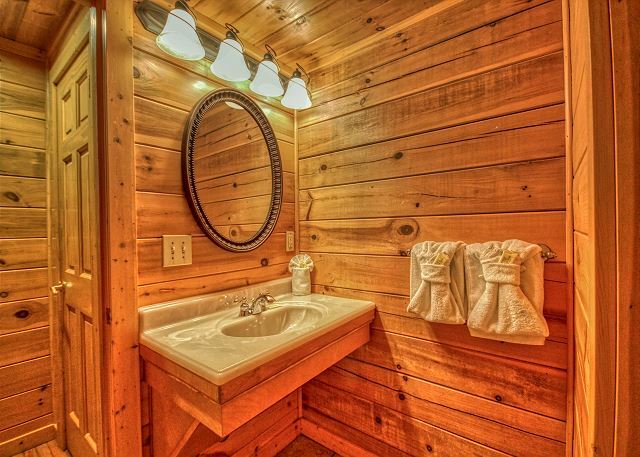 A Bit Of Heaven is a charming two bedroom log home with wonderful amenity package for the ultimate family vacation! VIEW NOW. Location: Pigeon Forge, TN (Less than 1 mile to the Parkway off of Light #8) near Dollywood/Cal Ripken Baseball Experience. NEW in 2019! 60 video games in one stand up arcade game for amazing entertainment during your vacation! NEW Large SmartTVs & premium 9"mattress sleepersofa, plus flat screen TVs in all bedrooms for ultimate, relaxing vacation! 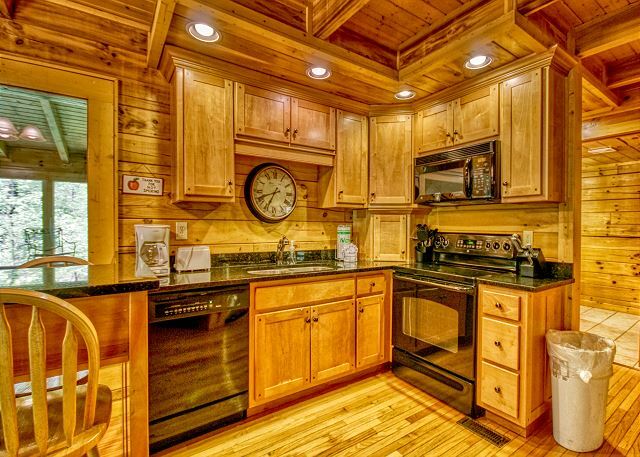 This vacation log cabin is a very unique find, just off the Pigeon Forge Parkway! 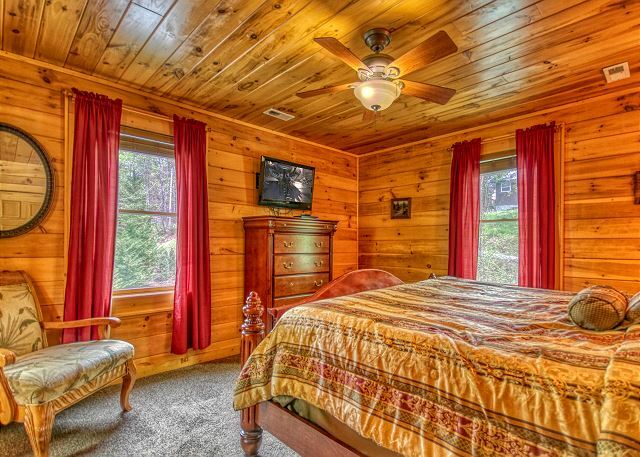 It's close enough to walk or shuttle to the Parkway, Dolly's Dixie Stampede, The Island, Leconte Convention Center, The Car Show events, or the Little Pigeon River. Did we mention it had its own professionally-maintained indoor swimming pool, that is private for your family or group? 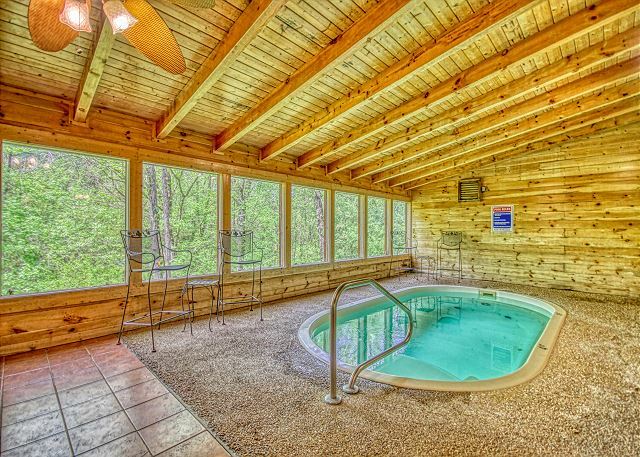 This heated pool cabin is one of the only non-mountain road cabins available in Pigeon forge for incredible vacation experiences! Update: All NEW SmartTVs aka premium flat screens installed since photos taken! Enjoy your favorite movies or sports on Big Screen TVs now! 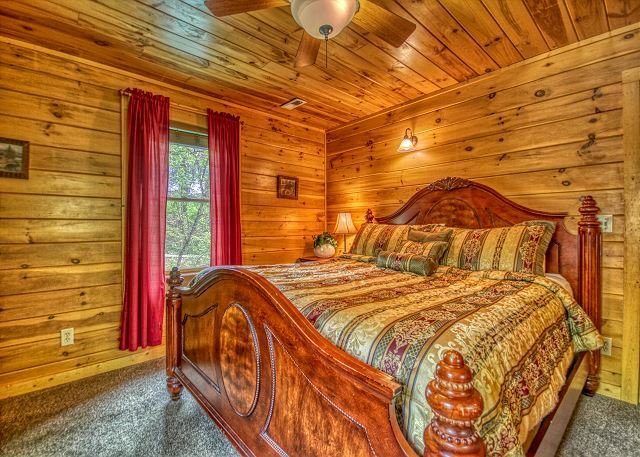 You'll love this beautiful log home which features two King bedrooms, large gameroom, premium sleepersofa with executive mattress, and custom full kitchen. 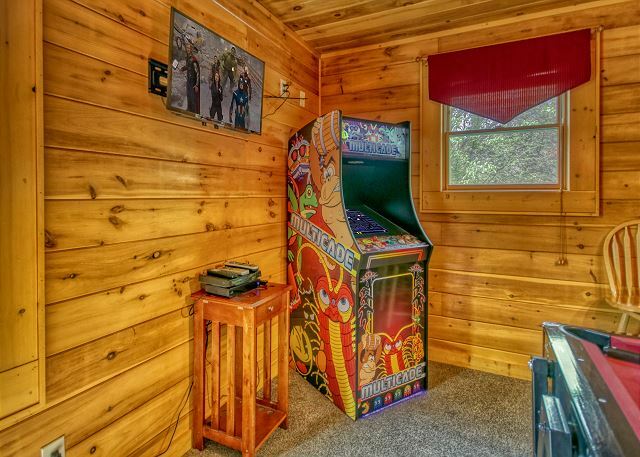 This Pigeon Forge cabin has enough entertainment for everyone! This amenity package includes: Flat screen TV with Charter Cable package, Wifi internet access, pool table, foosball, and indoor swimming pool! It's packed with fun ang great for any special occasion. Book any special event, holiday, or family vacation here at Gone Swimmin' for the vacation of a lifetime! 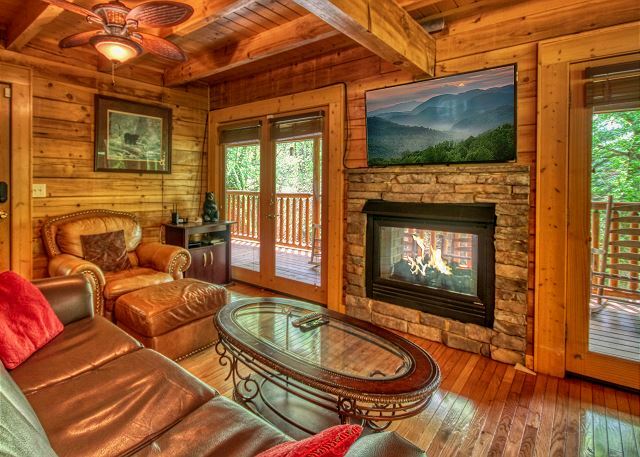 This two bedroom log cabin, near Dollywood, has it all! With so many amenities to keep you busy, you won't want to leave! 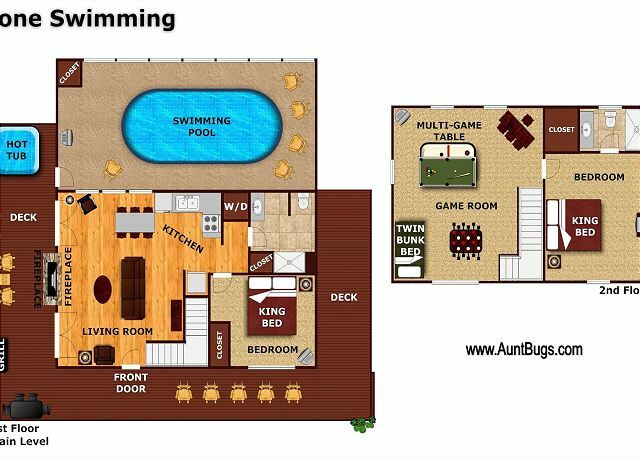 Features include private indoor pool, hot tub on the wrap-around porch, game room with pool table, air hockey, poker table, foosball, internet access, four televisions, two King beds, two full baths, and a bonus set of bunk beds in the game room! Enjoy the double-sided fireplace from the living room, while relaxing and watching TV, or sitting on your rockers on the outside wraparound porch! Your park-style charcoal grill outdoors or full kitchen will enable you to cook any meal for your kids or friends. This Private Pool cabin is usually a 3 night minimum. For shorter stays, please contact the office at. 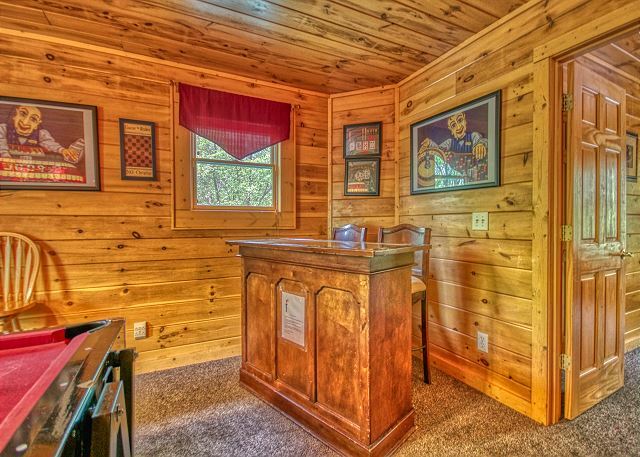 This cabin is located behind Dixie Stampede and is within walking distance of the Little Pigeon River. Price is based on 4 adults, each additional adult is $12.50 per night. This cabin does not allow smoking or pets. 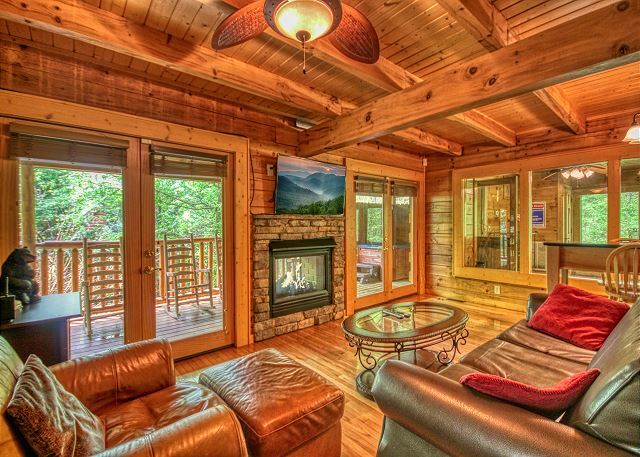 Reserve this cabin in advance or book it's neighboring sister property, Skinny Dippin #261! You may book both pool cabins side-by-side for groups that total 12! 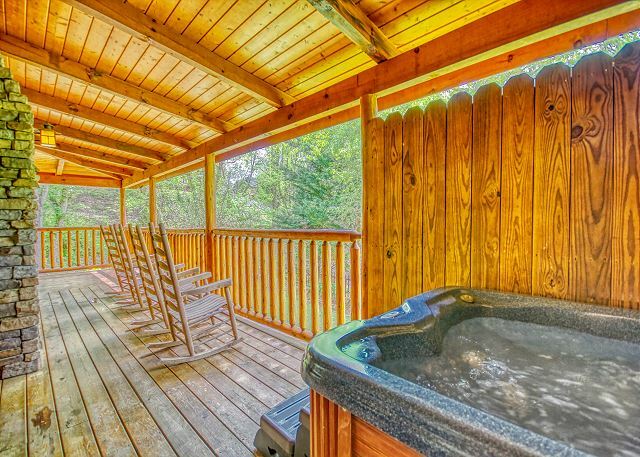 We had all the beauty of the Smokey Mountain wooded area around us with the privacy of our own swimming pool and hot tub. Everything was wonderfully maintained and the staff was always there if we needed them. We loved Gone Swimming! It had everything we needed, was close and convenient, the mattresses slept fantastic, and the pool & hot tub were wonderful! 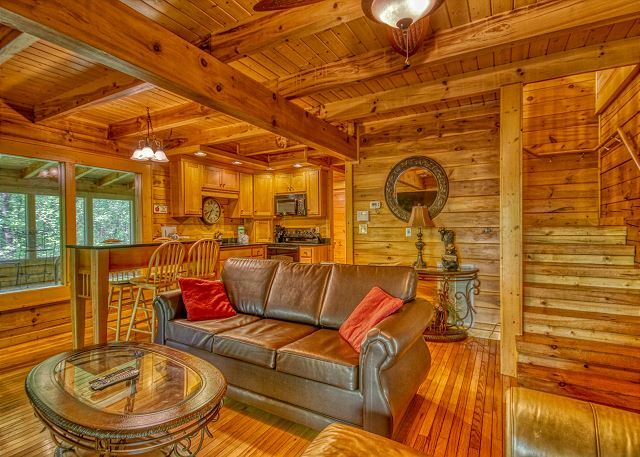 This cabin is right in town but feels like it's totally secluded. Close to everything. It was super cute and very clean. We had trouble with the wifi but that was fixed right away. The pool table/air hockey table is broken and needs replaced but my boys didnt mind, they played anyway, just had a little lean to it. Hahaha. The swimming pool wasn't as big as we thought but it was fine, got the job done. Overall we really enjoyed this cabin and would recommend Aunt Bugs! Enjoyed our stay at the cabin but if it would have been more than my husband and myself it was very hot upstairs in the cabin and we would have had to ask for someone come check out the reason for that because it would have been just to hot for sleeping upstairs. We enjoyed the cabin and pool. It was great to just relax. We had a great time in the cabin our 2 year old loved the pool. Easy one stop shop and rent for my family's stay on Pigeon Forge. Online review of rental inventory, quick reservation process, complete information package readily shared via email. Check in was quick and very easy and the cabin was great. WEW found it clean and in great working order. Checked out with my mobile device on the last morning of the stay again quick and easily! We very much enjoyed the location to all the area attractions. So close yet away from it too. My son and his wife and my grandson all enjoyed having our own private pool and hot tub in the evening after our busy days at the local attractions. Would definitely recommend. Great location, close to town, very clean. Will definitely book through Aunt Bug's again! The cabin is in an excellent location. It was very clean. The beds are so comfortable. My son loved the pool. Very easy checking in and out. Very nice staff. I would definitely recommend Aunt Bug's to my friends!! Thank you!! Absolute wonderful customer service through booking, arriving and check out. The staff was friendly and very attentive. Upon arriving to the house it was clean and ready for our arrival and stay for a long weekend. Everything is what you'd expect from a rental company and the location was couldn't be any better. I have stayed at several locations under the "Aunt Bugs umbrella." This cabin remains my favorite and I have stayed here numerous times. 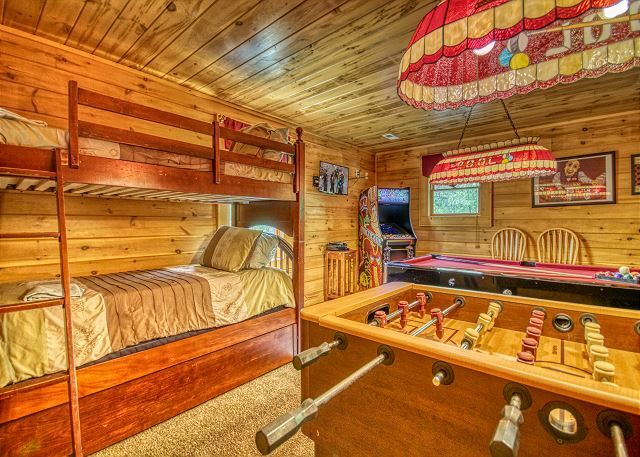 The entire cabin is amazingly great. Down below on location.... It is off the main "drag," but is @ 2 blocks from it.... Secluded, but close to everything. Our granddaughters loved the Foosball, pool and air hockey. Also, the swimming pool and hot tub was great! The cabin is set back in the woods, but very close to the Parkway, so no long drives to everything. Highly recommend! The cabin was fine and close to attractions and had a good layout. The only improvement that could be made would be to the pool deck finish. The cabin was nice and homey. We loved Gone Swimming cabin. Great location and very clean! Would definitely stay there again. This is a wonderful cabin. We loved the indoor pool! The only difficulty we had was we were without internet for 24 hours. Otherwise, we loved our stay at "Gone Swimmin"! We had a wonderful time visiting Tennessee! The cabin was cozy and we were very satisfied staying there. We enjoyed ourselves at Gone Swimming, our daughter Layla really loves going swimming everyday and playing outside. Even though we didn't get to barbeque because of the grill not up to par, we still had a good time, looking forward to going back again. Stayed four days with family including 2 three year olds. When asked what did you like most, they both said swimming. One day was rainy so we spent day using pool and game room. Fun for whole family. The cabin was very nice. The dryer made a very loud noise and we couldn't use it. The pool floor did need swept. Over all we loved the cabin. The cabin was was amazing and my kids had a blast in the pool! We arrived on Oct 22nd and checked out on Oct. 26th and had a wonderful time there. The cabin was great! My daughter and her husband came with myself and my husband. She swam every day that we were there. I swam 3 days and one day went in the hot tub. My husband and her husband played pool at night while we were swimming. I really liked that the pool was enclosed so that we were able to swim both day and night. The location is in a nice place. The driveway is a little steep, we are use to flat land coming from southern Louisiana, but it had ample enough room to turn around and park where you were able to pull out forward instead of backing out. I would rent this place again and would recommend it to other family and friends. 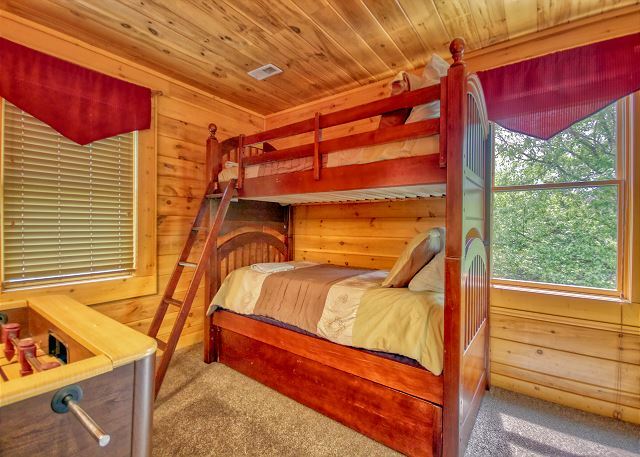 The cabin is very, very close to many attractions and is easy to get to the main strip. I was very, very pleased with the cabin. My husband and I celebrated our 15 year wedding anniversary at this cabin. We had a wonderful time at the cabin. The cabin was clean and was in mostly working order. There was a problem with the dryer and downstairs bathroom fan, but nothing that prevented us from having a great stay. 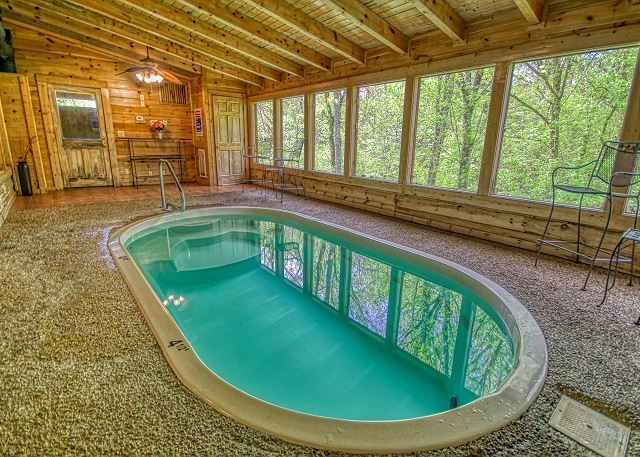 The pool and hot tub are definitely the main attractions of the cabin and they did not disappoint. 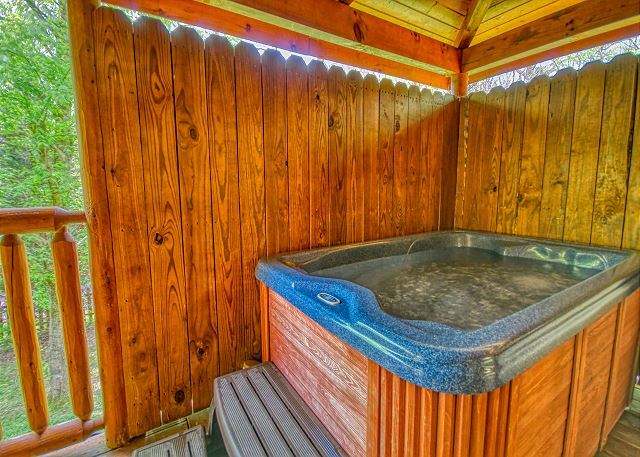 The hot tub is only a two person though,so if you have a party of more than two, you will have to take turns. The cabin is located close to everythig, but is far enough a way to feel very private. 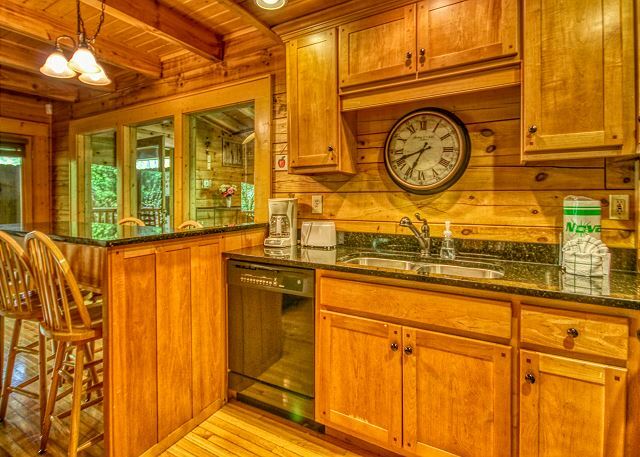 We would definitely recommend this cabin and would come back again! Great eperience, second year in the same cabin. It-town location great for kids. Aunt Bug's always does a great job. Amenities were good except there were too few glasses, plates aand silverware. had to clean before useing. Had plenty of towel. Just had to wash evernight. We really enjoyed our stay. When we came back for the day the kids had swimming and the game room to entertain them. 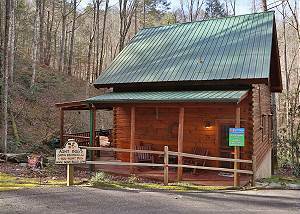 Have been vacationing in the smokies for 20 plus years , but this was our first cabin rental Experience . We loved the cabin and the management crew was top notched! Made our stay very relaxing and easie to love! Had problems with the sink draining on our first day and "boom" the maintenance man had it fixed within hours . Run out of propane for the grill and "boom" replaced it on call . Just ANYRHING we needed they made it happen!! THANKYOU Auntbugs for your consideration towards your vacationers! Two thumbs up! Our two boys LOVED the pool! We rented GONE SWIMMIN 260, brought 5 of our grandchildren with us. From the time we arrived till we left everything was awesome. After a day of exploring Pigeon Forge, it was nice to let the children relax and swim till late in the swimming pool. We all enjoyed the game tables. My husband and I drank coffee on the porch every morning, before the children woke up. I would recommend this cabin because it was really awesome. The beds slept so good. This was my families first stay with Aunt Bug, we loved it the staff was out of this world and the cabin was amazing. The maintenance men went above and beyond when we had a few small issues. Thank you! We stayed for two nights at #260 Gone Swimming for our daughter’s 8th Birthday. Staff was very helpful and friendly, check in & check out were simple & we had everything we needed & more. we all loved the cabin & pool & had a wonderful stay! We will definitely be back! Clean and courteous. We called about the pool water being too cold and within the hour someone was there to correct it. Made the swimming experience more comfortable for the kids, thank you!! Absolutely Amazing ! Great place for a family vacation that you will never forget . Cabin was great, staff was friendly and overall experience was enjoyable. Would be willing to use Aunt Bug's again. 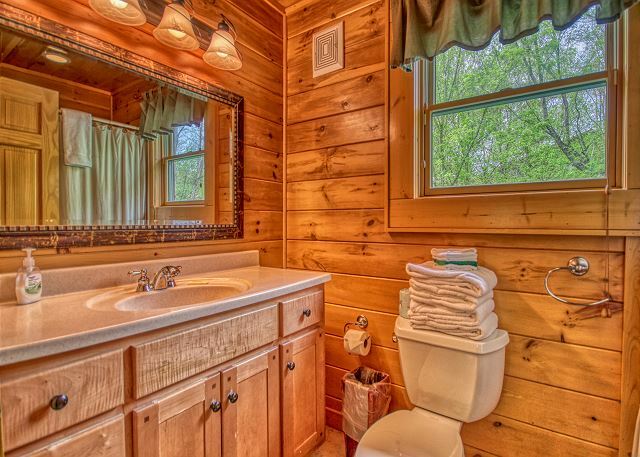 Enjoyed the cabin and the privacy. Well stocked and beautiful inside. The pool and hot tub were both great. We loved the cabin. It was well appointed, the beds slept great, pool/hot tub/porch were awesome and relaxing. The only complaint we had was the mosquitos were HORRIBLE. If you didn't spray immediately upon going out the door you'd have bites everywhere. As far as our check in the staff was very friendly but our cabin we stayed in could use a little more attention because the downstairs bedroom had a musty order which is were we slept on our three night stay because upstairs would have been to hot for sleeping it felt like the air conditioning had been cut off up there but as far as everything else we enjoyed. House was good. Would suggest more/better cookware. Pool was nice. Hot tub overheated but was addressed quickly. Aunt Bug's cabin rentals are truly the friendliest people to work with. The cabin was cute and cozy. Just what we needed for our vacation. The cabin was very nice and we enjoyed our stay!!! Wonderful and friendly... great cabin... not far from town, great experience, will go back through Aunt Bug's! Definitely kept kids entertained. Cabin needed more lighting outside. Coming back next year. Very pleased with "Gone Swimmin". Wonderful cabin. Easy check in/out. House was warm and inviting and spotless! The private pool was exceptional. Every detail was thought of as a home away from home. We were comfortable instantly! Didn't want to leave! We were really pleased and and enjoyed the cabin it was our first time doin something like that and we will be back thank you. The cabin was good however the TV in living room never worked right even after maintenance came out. Had to watch one channel. The hot tub quit while we were gone and when the lid was opened it had odor of dead fish. The pool was great. Cabin was clean and ready for use. No waiting. Loved the ease of use of the mobile app before, during and check out after the stay. Great job by your team and technology! The cabin was very accomodating for our needs. We had the items necessary to make a home cooked meal. We also thought it was clean. Did great. Not hard to find and a beautiful cabin. The cabin provided a great getaway for our family. My 2 sons loved the pool, air hockey table, and Foosball table. We all had a great time. Cabin was nice and in a great location. Check in and check out was very easy and convenient.